Do the screwless switches and sockets fit into standard back boxes? Yes, the screwless switches and sockets are a dual plate system. The first plate screws in as normal, the second plate fits over the top of the first creating the screwless effect. How deep must the back-box be in order to accommodate the switches and sockets? The full Trendiswitch range will fit comfortably in a 25mm back-box. The minimum depth required is 16mm, however the bigger the air space around the module, the better the air flow will be around the module to promote cooling. 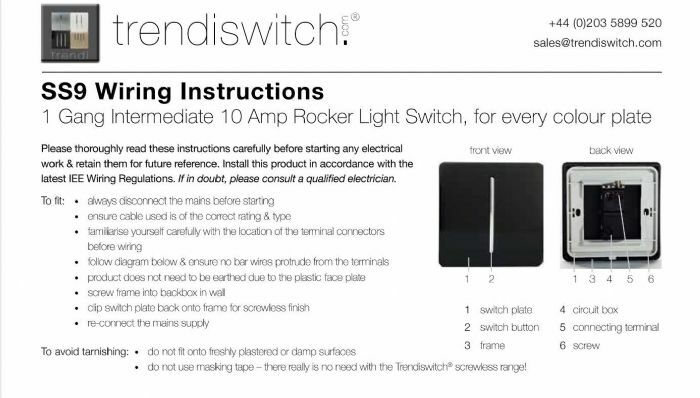 Yes, the full Trendiswitch range is supplied with fixing screws & instructions on how to install the product. 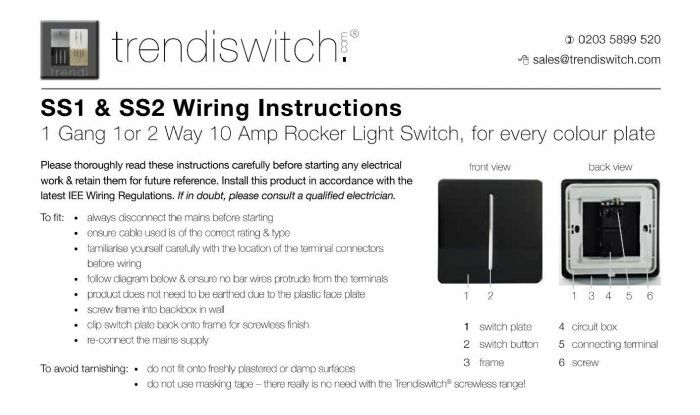 They are easy to install - simply replace your old switch as no additional wiring is required. What material are the plates made of? Each product is made from a high quality plastic which will not fade and is easy to clean. The wiring behind the switch or socket is encased in a fireproof ABS plastic module. Are the products produced to European standards? Yes, all the Trendiswitch products are manufactured to CE Certified standard and the double plug sockets to BS1363. If I'm updating all my switches does this mean that I'll have to replace my light bulbs too? No. Trendiswitch products work with all common types of light bulbs, eg. incandescent, fluorescent, LED etc. Is the Internet Electrical Store an authorised Trendi Switch re-seller? Where can i find technical information on the Trendi Switch products? How does the screwless plate work? How do i wire a 1 gang 1 or 2 way switch? How do you wire an intermediate (3 way) switch? 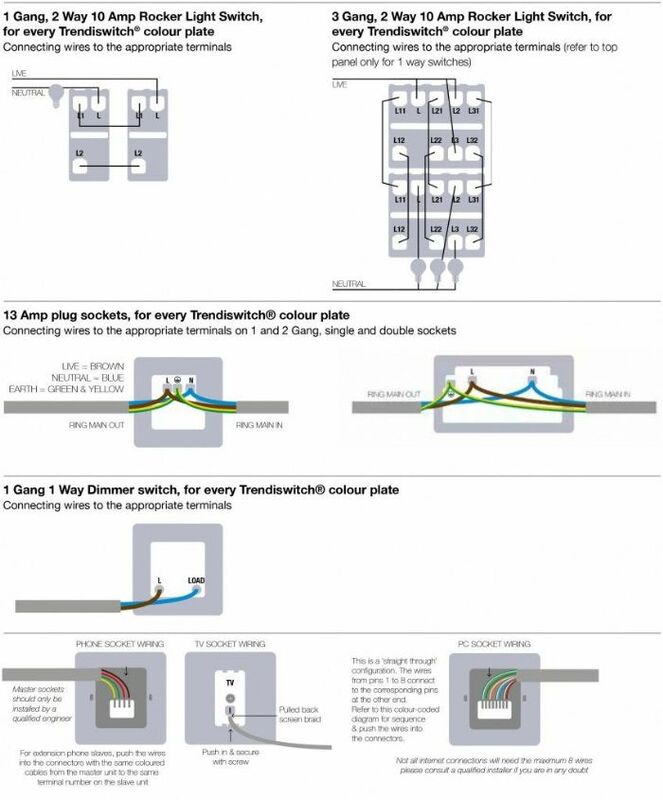 How to install a USB double plug socket? How do I wire 1 & 2 gang plug sockets? 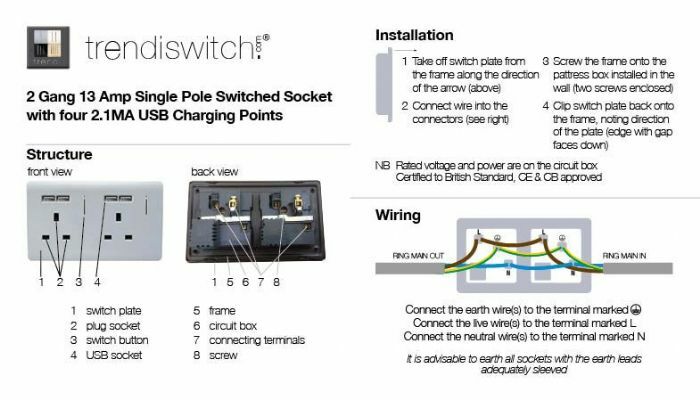 Is there anything else you would like to know about Trendiswitch products? Please get in touch direct, via our contact form, via email: sales@theinternetelectricalstore.com or give us a call on Freephone 0800 043 5532 or 01342 821433.